Hiver is a delicious craft beer brewed with urban and rural honey. With a background in microbreweries, Hannah knows a thing or two about creating a tasty tipple. With Hiver, she chose to tone down the hops and used an organic specialty malt to make the honey flavours shine. The beer itself is long matured and unpasteurised. 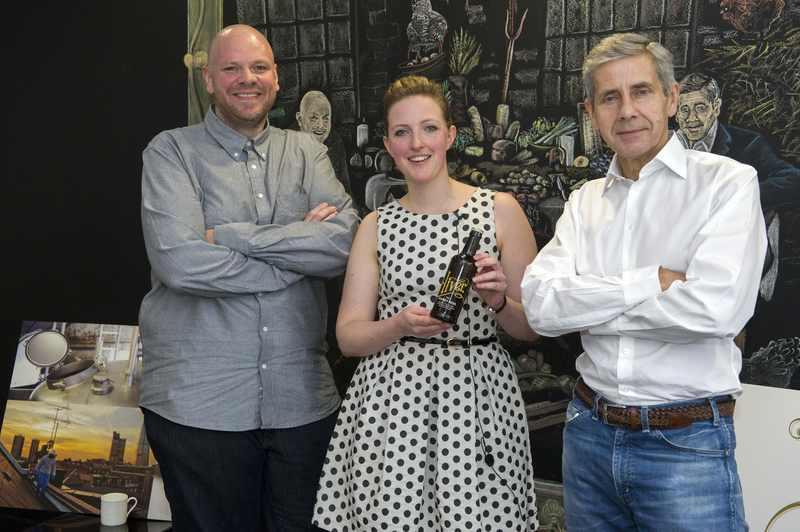 Our judges, including Michelin-starred chef Tom Kerridge and retail legend Sir Stuart Rose, were bowled over by the beer (Tom Kerridge has since put it on the board at his famous Hand and Flowers pub), but they were also impressed by Hannah herself. A young entrepreneur, she is full of passion, not just for craft brewing but also for beekeeping and conservation. As Tom said, “the entire Hiver product, from taste to packaging, has been carefully crafted”. Even her business cards have that thoughtful touch: they’re laced with wildflower seeds so you can plant them and create food for bees. Sir Stuart Rose put it like this, “Hannah and her Hiver Beers had it all – an intriguing back story, a passion for the industry, a great tasting, quirky product… but Hannah’s holistic approach to her product and brand is what really sold it for me”. This entry was posted in Britain's Next Top Supplier, Talking Ocado and tagged beekeeping, beer, Britain's Next Top Supplier, competition, conservation, craft beer, Hand and Flowers, Hiver Beers, honey, Michelin Star, microbrewery, new product, Ocado deliveries, Organic, Sir Stuart Rose, small suppliers, Tom Kerridge, urban honey, winner, women in business by Naomi. Bookmark the permalink. I am absolutely thrilled to hear of this. I know Hannah and the London Beekeepers Association is lucky enough to have her as a member. She very actively supports us and our ethos around fun and responsible urban beekeeping. Hivers kindly donated their amazing beer to volunteers at a recent planting event in London to increase forage for London’s bees. Well done.